Initially I went to school thinking that I wanted to be a theatre educator and I realized that just wasn’t quite my path, but I wanted to stay in the theatre industry. I was in school at University of Texas at Austin where I worked as David Stewart’s assistant. That got me deeper into the industry. Now this was my fifth USITT Conference. 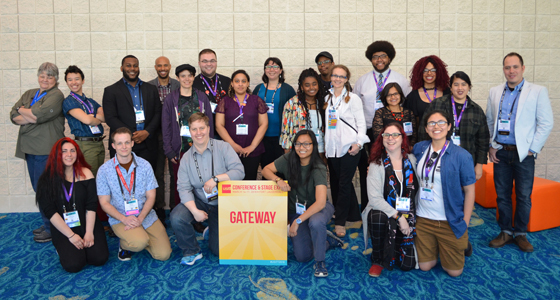 How did you get involved in the Gateway Program? I was part of the pilot program in 2013. That program was assembled pretty quickly and put together after the death of Tayneshia Jefferson. Planning out what a program might look like started to happen and then three mentees were at the Conference that March. I was a part of that first group and my joke is that they “kept me after that.” I came here and very quickly felt at home. I was excited to stay involved. What is your definition of the Gateway Program? Have you found the program successful so far? I think so! For example, we had a mentor/mentee pair that really connected at the Conference, and they visit each other a couple of times a year, talk regularly, and right now they’re actually both working on a production team together as designers. 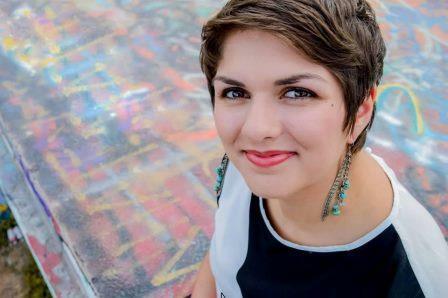 Another mentee, Marisa Melito, came to Conference and was studying technical direction at DePaul University. She was kind of shy, pretty nervous, and ended up in a session run by the Safety & Health Commission. She then went to the Safety & Health Commission reception and was put on a panel to present the next year and is now leading sessions and is very involved in that commission. She’s an Early Career person, and I love seeing those people staying in the Institute and being involved. I think that that success has so many other measures. It’s going back to their schools and getting other people interested in USITT and the Gateway Program. It’s advocating that this is a great opportunity for students and faculty to send people to the Institute. People leave with skills around professional networking and building their professional materials. They come out with more than what they had to begin with, and that is also a part of the success of this program. I am excited to keep highlighting the way it impacts the Institute and impacts members that we see every year. I’m also pleased with the way people take their knowledge to their home Institutions and its impact outside of USITT. 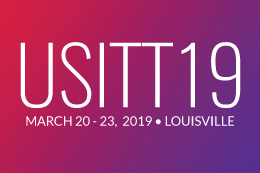 Have you seen a growth in diversity and inclusion throughout USITT and the industry? We look at numbers, so if we look at attendance for sessions like People of Color Network, Women in Theatre, and Queer Nation, when I first attended they were smaller groups. In the time that I’ve been here, there were years where we started in one room and we were over capacity and had to move before the session could start because people couldn’t get in the door. I think that is a result of the momentum of the Gateway Program. There are sessions that are about our industry and our work and there are more sessions that include a lens toward equity and inclusion. It’s not just about the sessions that start with that, but it’s about how does every session include that lens and include that awareness? Until our industry is fully steeped in that awareness, we’re not going to have the kind of progress that we need. Any advice for a Conference or Gateway Program first-timer? People who are interested in the Gateway Program should have someone nominate them or nominate themselves! It’s an incredible program. There are 12 mentees every year and I feel so lucky and thankful that our selection process gets harder and harder every year. I hope that people feel like there are other ways to access this Conference, whether that is through the Student Volunteer Program, Early Career Awards, Stage Management Mentor Project, etc. I hope that more people of color and more people who are underrepresented in this industry will apply to those programs and that those programs will continue to build their awareness of who traditionally has had the most space in them and how they can recruit more broadly.